Why couldn't it be a badger? Or a raven? Or even a squirrel? Nope, it had to be a wolf. Now you might wonder why we're grumbling. After all, doesn't the world and his wife want a wolf as a power animal? Well, yes, and that's the problem. You see, most pagans think they should have a 'power animal' or a 'totem animal' or even, sometimes, a 'spirit guide'. Those pagans who are into Heathenry might even go looking for a fetch or fylgja. And they all want big, glamorous carnivores. And those who want to be shamans and don't really know enough about shamanism, or have become enamoured of Native American spirituality through the tat sold in New Age shops, or via the internet, want to have a wolf as their whatever-it's-called-this-month. It's the ultimate pagan fashion accessory. If Dolce & Gabbana made power animals, they'd be wolves. I blame the whole NA cult thing. years ago a friend who owned a market stall took me to a warehouse stocking things for pagan shops and market stalls. There was a long aisle full of smudge sticks, dreamcatchers and images of wolves. Always a single wolf, standing or howling, standing beside an NA in full feathered headgear, or a wolf face beside an NA with the headdress. The pagan equivalent of the revolving statue of the Virgin Mary a Catholic friend of mine brought back from Lourdes. So, two days ago, we're in a restaurant in Scotland and the talk turns to spirit guides. At this point, Jenny and I shut up. If it's not half the pagan world claiming to have a wolf as their whatever they want to call it, it's the other half ridiculing the popularity of the wolf. So there's no point in either of us saying anything, as we're damned one way or the other. And, if that's not bad enough, there's the whole problem about the language used. A totem is not the same as a 'power animal' or a spirit guide or a fetch. As ever in the pagan community, terms get bandied about without any real understanding. But hey - it's a wolf and everyone wants one. So what is it? Or what are these concepts? The word comes from the Ojibwe language. The Ojibwe are the third largest First People grouping in North America, stretching from Michigan to Montana in the US, and from western Québec to eastern British Columbia, where they are known as the Saulteaux and Mississaugas. Their kinship groupings are extensive and give rise to their philosophy of the interconnectedness and balance between all living generations and all generations of the past and of the future. The Ojibwe people were divided into a number of odoodeman (clans; singular: odoodem) named primarily for animal totems (pronounced doodem). The five original totems were Wawaazisii (Bullhead), Baswenaazhi ('Echo-maker', i.e., Crane), Aan'aawenh (Pintail Duck), Nooke ('Tender', i.e., Bear) and Moozwaanowe ('Little' Moose-tail). The Crane totem was the most vocal among the Ojibwa, and the Bear was the largest — so large, in fact, that it was sub-divided into body parts such as the head, the ribs and the feet. So the totem is not an animal which protects an individual, but is part of the identity of a clan. In the mid-twentieth century to the great anthropologist Claude Lévi-Strauss studied kinship and religion among peoples who did not live by written records. When he studied Totemism he looked at the ideas of Firth and Fortes, Durkheim, Malinowski, and Evans-Pritchard (significant figures in sociology and anthropology) to reach his conclusions. Firth and Fortes argued that Totemism was based on physical or psychological similarities between the clan and the totemic animal. Malinowski proposed that it was based on empirical interest or that the totem was 'good to eat.' In other words there was rational interest in preserving the species. Finally Evans-Pritchard argued that the reason for totems was metaphoric. His work with the Nuer led him to believe that totems are a symbolic representation of the group. Lévi-Strauss saw Evan-Pritchard's work as the correct explanation, and we would agree with that. By the way - 'Totem poles' are not representations of totem animals or figures. They have nothing to do with totems and are mainly heraldic devices or recount stories. 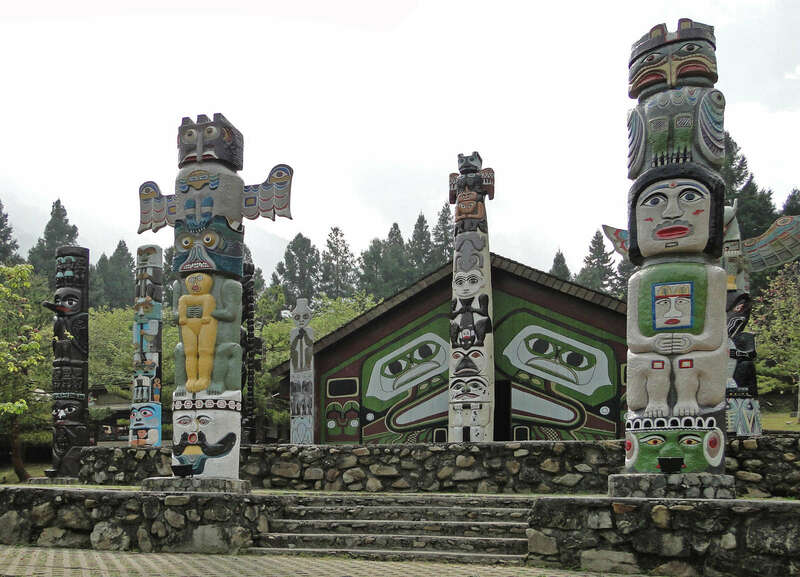 The meanings of the designs on totem poles are as varied as the cultures which make them. They can recount familiar legends, clan lineages, or notable events. Some poles are erected to celebrate cultural beliefs, but others are intended mostly as artistic presentations. 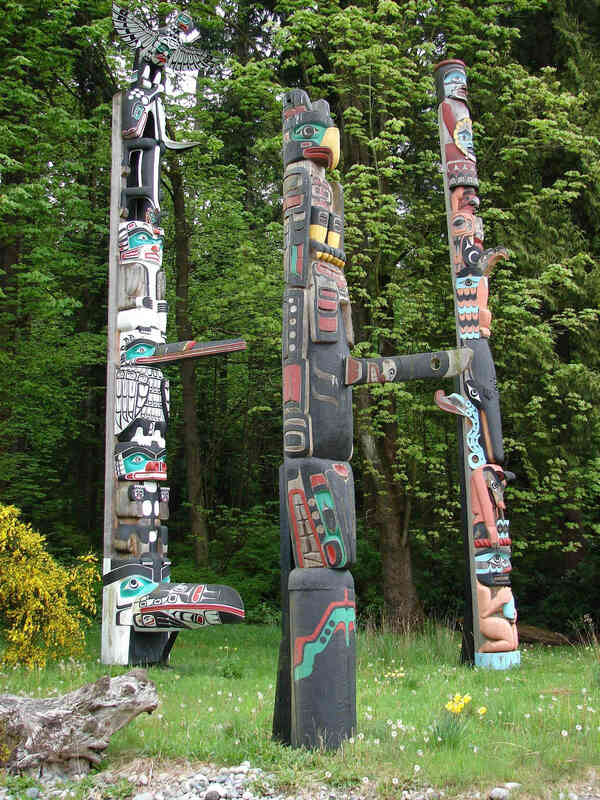 Certain types of totem poles are part of mortuary structures incorporating grave boxes with carved supporting poles, or recessed backs in which grave boxes were placed. Poles are also carved to illustrate stories, to commemorate historic persons, to represent shamanic powers, and to provide objects of public ridicule ('shame' poles). 'Power Animal' is a difficult concept to deal with as it appears to be recent, and a mish-mash from ethnology, anthropology and sociology, via modern shamanism. Alexa has seen definitions which draw on both a 'spirit guide' and the Anglo Saxon fetch. I suspect someone wanted to invent a term which could loosely encompass other terms from specific cultural contexts in order to strip off the cultural associations. So, unless either of us can trace a better history of the term, we're leaving it to one side. 'Spirit Guide' isn't much better. The term is probably better known in connection with either the Spiritualist Church or Native American religions (referred to as 'spirit helper'). 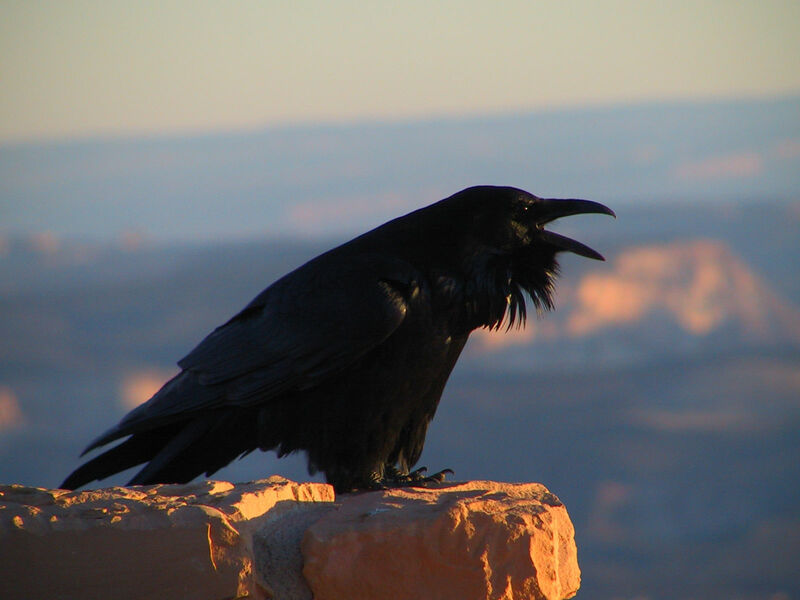 There are conflicting messages about spirit guides and power animals. One modern shamanic teaching is that you can't be sure it's your guide animal until you've encountered it four times. We don't go with that one, as you'll see from our personal stories. Another teaching is that different guides/animals will come to you at different times of need, or different times of your life, depending on what you're doing or what you need to learn. Our own personal experience doesn't lead that way, either, but that's because neither of us would claim to have a power animal or spirit guide as such. We're both Heathen, and what we have is a flygja (Old Norse) or fæcce (Anglo Saxon - pronounced 'fetch'). This is completely different from an animal archetype which might appear or not according to the needs of the shaman on a particular journey, or when carrying out a particular healing. A Fylgja (literally: she who follows; plural: Fylgjur) is, according to Scandinavian mythology, a supernatural creature which accompanies a person. It usually appears in the form of an animal, and as it was believed to correspond to a person's character or way of living, it can be conceived of as a form of a person's soul, separate from the body and thus not identical with it. Consequently, a warlike man might have a bird raven, a horse, a wolf or a bear for a fylgja. The Fylgja commonly appears during sleep, but the sagas relate that they could appear while a person is awake as well, and that seeing one's Fylgja is an omen of one's impending death. However, when Fylgjur appear in the form of women, they are then supposedly guardian spirits for people or clans. So, for the two of us, what we have is a fetch, which is part and parcel of ourselves, but also something which protects us. Alexa experiences it very much as part of herself, which influences her behaviour when needed, though she has never seen her fetch externally save the once, during the only shamanic journey she has undertaken. Beyond that, it is part of her when she visits the Otherworld, and in other dealings with such liminal activities. Jenny, on the other hand, can be aware of her flygja as a separate being, outside of herself, and knows it protects her when she engages in her seidr work. If we had the choice we would probably have chosen something else. A stag, or a stallion. Or an otter. But neither us can change anything, any more than we can change the colour of our eyes, or our height. We have what we have. And so we're stuck with not joining in on conversations about power animals, as everyone else seems to want it. Ho hum. Such is life. Damn it. 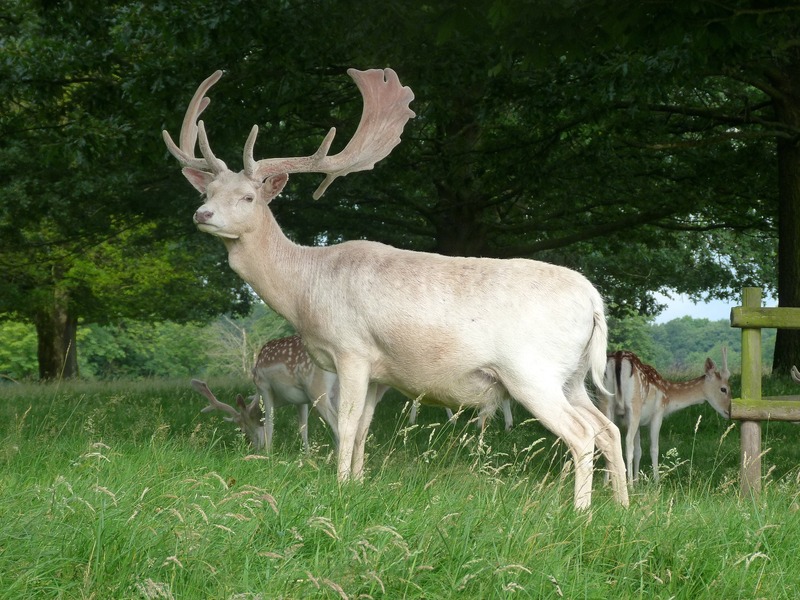 white stag courtesy of pixabay. © Jenny Blain and Alexa Duir 2008. All rights reserved.